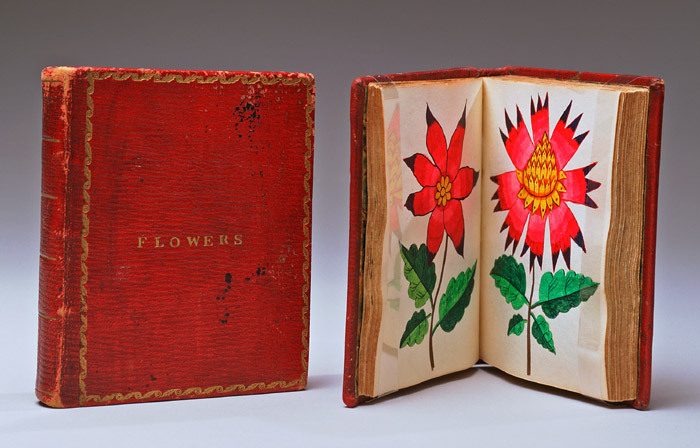 The first book having ninety drawings, marbled endpapers, floral decorated title page inscribed: : “HENRY / VAUGHAN / JUNE / 1833”, original red leather binding with gold stamped title “FLOWERS,” ornamental scrolled border, and the numeral “1” on the spine. The second book having one hundred drawings, marbled endpapers, floral decorated title page inscribed: “HENRY / VAUGHAN / JUNE / 1833”, original red leather binding with gold stamped title “FLOWERS,” ornamental scrolled border, and the numeral “2” on the spine, bears an old pencil inscription “100 Flowers” on interior side of frontal endpaper. Possible identifications for the artist of these exquisite drawings include two Henry Vaughans born in Sumterville, South Carolina; the first with life dates of (1800-1870), the second (1819-1897); a Henry Vaughan (1798-1870) born in Plattsburg, New York, and a Henry Vaughan listed in the 1860 United States Federal Census born about 1819 in Maine.